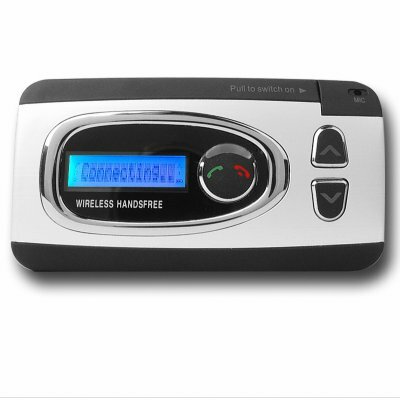 Successfully Added Bluetooth Portable Handsfree Home + Car Kit - Caller ID to your Shopping Cart. Headset and Handsfree Bluetooth enabled device for use in either a car or at home or office and coming with a very useful Caller ID feature. Attach this device either to your sun visor in your car with the included and adjustable sun visor attachment, or use it in your home or office with the built in back stand. Other great Bluetooth features include an easy to see blue backlight for day or night use, call waiting and transfer, pairing with up to 4 mobile phones simultaneously, battery protection, DSP, and great sound available with the 2W speaker or the 2.5mm audio jack for privacy. Make your home or your car a Bluetooth enabled workspace with easy use, pairing, and installation, and available with Chinavasions always included 1 year warranty..